Welcome back to the Festival Season! We're starting our recording (today, on release day!) on the way to Trillium (we're borrowing some random free Wi-Fi on our trip to bring this to you) for the future. Already, we've got new episodes in the can, so expect to see some regular releases here in Season 2! Plus, enjoy our new theme music, previewed at the very end of Season 1, by our own Grove Bard, Mike Bierschenk. 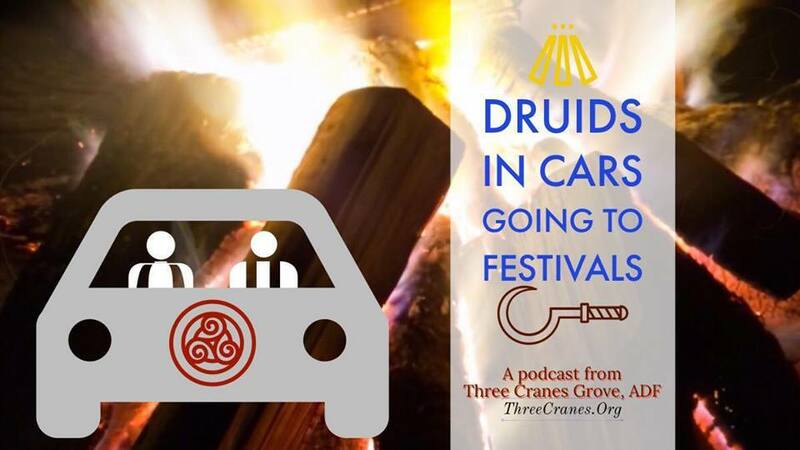 We look forward to more conversations, with more people, and a lovely time as Druids in cars, going to festivals! November 1st starts our #PrayerADay challenge, and it's a Thursday, so we're releasing (by the skin of our teeth) an episode where Rev. Avende discusses the history behind the challenge, and how you can participate! You can join the #PrayerADay Facebook group if you want to write, follow the fun on the #PrayerADay Project Facebook Page if you just want to read, or follow @adfdruidry on Tumblr to see the posts scheduled out. Season One of our podcast is mostly over with the festival season coming to a close, but we have some stuff still in the can! We have a few bonus episodes to release, often with special guests, so do keep on listening and subscribing, and keep circulating the tapes to anyone who might not have heard them yet. You can always find us at threecranes.org/podcast and on our Facebook Page. Until then, if you're hungry for content, check out the Three Cranes Grove, ADF, Facebook or YouTube pages and like or subscribe over there. To learn more about Druidry, visit Threecranes.org or ADF.org. Bonus Episode 3 - Space Druidry! What does it mean to have an Earth-Based Spirituality when we're very far from our home planet? Originally recorded before this podcast ever came into being, Rev. Avende and Rev. Dangler had the chance to sit down with Rev. Rob Henderson at the ADF Clergy Retreat in October 2017 and discuss just that. Of all the people we could talk to about this, Rev. Henderson is the person we most wanted to chat with, and we're so glad we did. The topic is silly, but serious, and an ideal representation of the sort of weird things ADF Priests think about when they have time to shoot the breeze at a festival. So join us as we chat with Rev. Henderson about Space Druidry! Find out more about our podcast and find transcripts at threecranes.org/podcast, find us on Facebook, and learn more about Druidry at adf.org! Today, we interview Corbin once again at Summerland, asking him about his impressions of the manhood rite Three Cranes Grove, ADF, did for him as part of his transition, and how he was welcomed as a man into the Grove. This is an important discussion for us because it deals with both the design of transition rituals for trans individuals, and the necessity of welcoming and acceptance of a "new-to-us" gender identity among a community of people. Some colorful language appears, though it is bleeped in this version of the podcast. With Rev. Dangler attending Beyond the Gates this weekend (he's a Druid in a plane, going to a festival), we're releasing another bonus episode today. This episode discusses Three Cranes Grove, ADF's, Grove Poem, Clutiā Trion Garanonon: "The Fame of Three Cranes". About three years in, we wanted to commemorate our history in a creative, fun way. Rev. Hunt had the brilliant idea to use a poem that we could add to each year and speak at each anniversary rite. We'll chat about how we craft each stanza (poetry by committee! ), what it means to us, and how we've managed its length over the years. At Summerland 2018, we sat down (not in our car, but in the pavilion) with Corbin to discuss gender nonconformity among the spirits, and how we can make our language and work more inclusive. It was an excellent discussion, and one we've been hoping to have for a long while. This is the first part of two conversations with Corbin on this general topic. This episode contians a discussion about human body parts in vision and in art. There is also some profanity that has been bleeped. While our hosts are at the Summerland Festival, we thought we'd regale you with a bit of our lighter side of the work we like to do: some praise, both silly and sincere. This is our first "Bonus Episode," so we call out to the being we've sometimes called, "King of the Internet": Garanus, the Crane. If anyone can help us, it's that liminal, long-necked waterbird. Also given praise in these short recordings: The Bovine Earth Mother, Potatoes, and Redheaded Hotties. Also, we include a meditative charm to put a toddler to sleep. After all, we're all about threading the needle between "useful" and "serious" around here. With a larger gathering of ADF Priests, Rev. Avende took the opportunity to return to the issue of vocation at the 2018 ADF Western Clergy Retreat. Revs. Melissa Ashton, William Ashton, Sara Blackwelder, and Lauren Mart all discuss their experiences with vocation and what it feels like to them, as well as how they have found nuance and depth in the work. For more information and transcripts, find us at threecranes.org/podcast, or find us on Facebook, or check out our YouTube page for more great content! Learn more about Druidry at adf.org! Next week is the Summerland Festival, starting on Thursday. We hope to see you there! At the 2018 Western Clergy Retreat, Revs. Jan Avende, Melissa Ashton, Sara Blackwelder, Lauren Mart, and Kirk Thomas sat down to talk about what it feels like to be geographically isolated and doing work, both before and after ordination as an ADF Priest. They discuss a variety of issues they've encoutered, talk about the differences between different parts of the country, and consider a few strategies to make the distance seem less wide and impossible to cross. Visit us at threecranes.org/podcast for info and transcripts, find us on Facebook, and learn more about Paganism and Druidry at adf.org. Lucky number 13 brings us to a discussion from the Western Clergy Retreat about Ritual Bloopers and Fails! Rev. Avende sat down with several ADF Priests to discuss just how human they really are, and hear some of their best (worst) stories about how things went terribly wrong in ritual, and how they managed to keep the ritual going when it happened. Rev. Avende is joined in this episode by Rev. Melissa Ashton, Rev. William Ashton, Rev. Sara Blackwelder, Rev. Lauren Mart, and Rev. Kirk Thomas, and each shares a story (or two) about the things that stand out in their memory as the key bloopers of their lives as Priests and celebrants of ritual. Tune in, enjoy the laughter, and listen stories of high-flying acrobatics, trees being knocked over, wells shattering upon the stones, and (of course) things catching on fire (unintentionally)!